Simplicity, elegance and durability: the hallmarks of Shaker tradition, now improved with steam-bent rear legs. Designed by master chair-architect and craftsman Brian Boggs and built at the Doxa Shoppe. Thick Kentucky hickory bark is stripped in the Spring by hand. This seat has a coat of boiled linseed oil on it. Bark will last 50+ years, a very durable seating material which is underutilized today. The thicker bark is not the easiest to weave...about 2-3 hours start to finish. Wood workers love natural-colored wood and lobby hard against staining. The reason? It is simply impossible to imitate all the natural, God-given color variation. These myriad subtle differences add visual interest to the piece. Staining just covers all the subtle tones and unique color variations inherent in timbers such as walnut. Pictured below - Ladder-back chair set in black walnut with Shaker trestle table in book-matched quarter-sawn walnut. Note how you can use different woods to complement each other instead of competing with each other. Here black walnut complements the hickory floor. You can use the white bright color of lacquered maple to do the same thing in a dark dining room with, say, a Brazilian cherry floor. An extreme close-up of the workmanship. The slat tenons are hand fitted to very exacting tolerances (.2550 tenon into a .2500 mortise). They are 3/4 inch long and pinned with pyramid-shaped pins for decades of everyday use. Post and rung ladder-back chairs in paper birch, painted with layers of authentic milk paints with a matching hand-carved table. The chairs have Lexington Green over crackled Pitch Black with mild Barn Red. 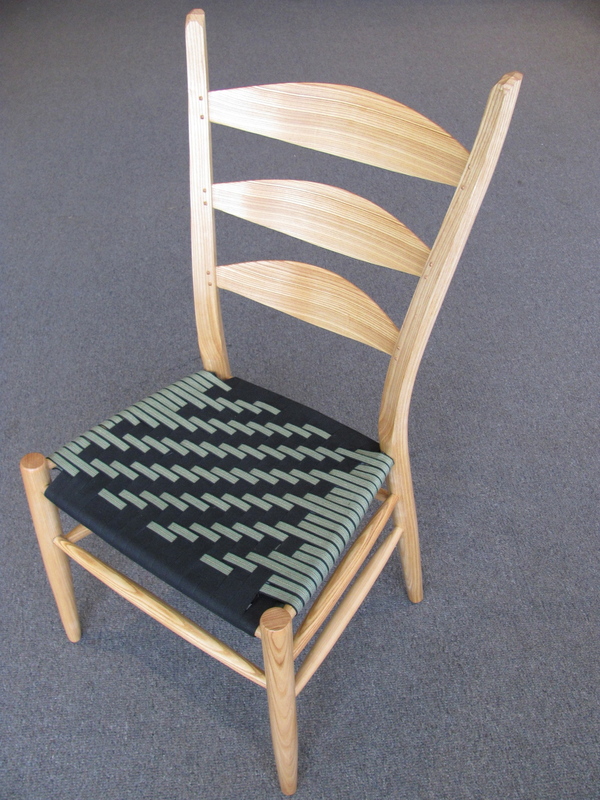 Chair seats are 5/8" olive black stripe and 1" black in a herringbone weave. Table top is exhibition grade birds-eye maple, high-gloss varnish finish. A lot of wood workers love ash. Include me in that list. It works well, bends well, finishes well. Here's some black ash from a log in my backyard. Note the very straight grain in the slats. Nice. It makes a very light, yet very strong chair. Combine the beauty of a solid-wood top with genuine old-school milk paint! See www.milkpaint.com for color combinations and www.hhperkins.com for Shaker tape color combinations. Paint grade chairs and tables come in birch and soft maple. The client specified a "rugged" look, showing random facets from the drawknife with layers of colors and textures coming through. The seat rungs are oak for strength--everything else birch. Southern red oak with hickory bark seat. Note the beautifully straight rift-sawn grain in the back legs and the quarter-sawn grain of the slats. Solid and sturdy, this is red oak at its best. The medullary ray flake of the oaks is stunning. In this example of bur oak (a type of white oak), the ray flake gently sweeps your eye through a series of curves over the whole length of the back of the chair. This is oak at its finest--showing quarter-sawn grain. Too many people dismiss the oaks today because most of what they see is flat-sawn. A princely wood, the oaks are hard to beat. Hardy, durable--they delight you with their natural coloring and their unique patterns of ray flake. You can also add a quarter-sawn table top to pick up the themes in the slats, tying the whole set together beautifully. This is an arm chair from the Porter set. We added a rocker or two. A six-slat Boggs' rocker in curly red oak. Upcoming chairs--we make most of our chairs from individual logs for the best color and grain consistency, except for paint-grade chairs. Log ends are sealed to minimize checking. Northern red oak--nice clear stock, some curl, outstanding quarter-sawn material. Clear, creamy sugar maple--super sweet. Hard and heavy. See pics. Bur oak (in the White Oak family). A monster 20ft long log with lots of straight grain and nice color. See pics below. Cherry--some of the best cherry comes from southern MN and western WI. Black walnut--top grade, ultra clear. Gorgeous creamy white sugar maple. We bought three super clear, perfect logs. This is slow- growth northern Minnesota stock. Nice straight, tight grain (on right) for back leg material. Freshly cut clear bur oak (often classified and sold as a white oak). Center of slab is more flat sawn for parts--rungs and front legs. Outer edges have nice straight grain (rift-sawn)l for back legs.